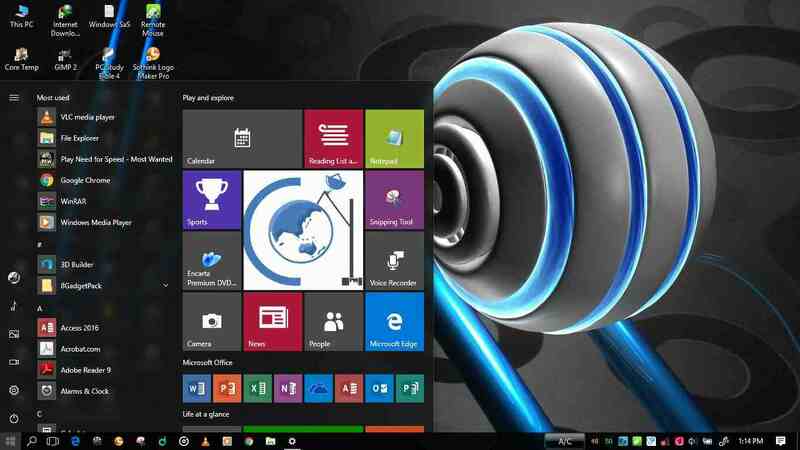 Home Software and Utilities Corel Aftershot Pro - Review. Corel Aftershot Pro - Review. With more and more people moving to digital SLRs , the need for software that can manage and make the most of photos shot with these higher-end cameras increases. The dominant player in photo workflow software among photo professionals has for a while been Adobe's Lightroom ($299), but Corel now offers a more affordable option of its own with AfterShot Pro ($99.99). As a new, first-generation app from Corel, After Shot Pro draws on technology from the company's acquisition of Bibble Labs and from its own PaintShop Pro ($99.99) with an eye to honing the product down to just what pro photographers need, rather than including the raft of image embellishments offered in the Photoshop-emulating PaintShop Pro. 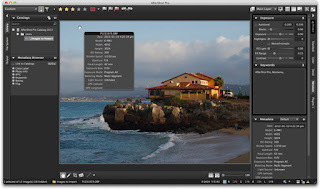 How well does it succeed in offering a lower-cost alternative to Lightroom or to the identically priced CyberLink PhotoDirector ($99.99) and Serif PhotoPlus ($99.99)? Read on to find out. Installing AfterShot is quicker and simpler than do so with PhotoDirector, since it's a smaller download and doesn't require Microsoft C++ runtimes to be installed. 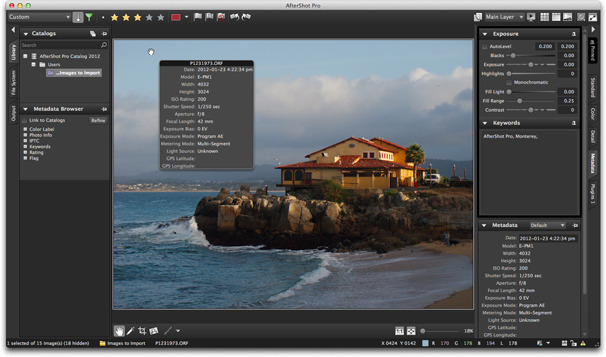 Unlike most other photo workflow apps (notably Lightroom and PhotoDirector), AfterShot Pro does not use a "modal" interface, in which buttons or tabs take you through modes for organizing, editing, sharing, and whatever else the software though made sense to break down to it own separate task—print, Web, or whatever. Instead, you have a simple three (and sometimes four) panel interface, with the "Browse panel" on the left, the main image or gallery view in the center, and adjustment tools panel on the right. The fourth panel is a filmstrip view of your source images, which you can alternately run across the top by choosing Toggle Orientation from the menu. You can easily toggle any of these panels on and off with arrow icons or View menu options. Added to this are buttons along the top for star-rating, flagging, rotating, and filtering photos. Along the bottom, another toolbar gives quick access to zooming, cropping, and white-balancing with a dropper. Finally, you can toggle clipping display with a warning symbol button here, which provides an easy way to see under and overexposed areas in your photo. In addition to menus and interface toolbars, the program offers a generous selection of keyboard shortcuts, for accomplishing pretty much any photo or interface task available. I could easily switch to fullscreen view with either F11 or the arrow button at top-right, but there's no support for dual monitors, as PhotoDirector and Lightroom offer. A magnifier or"loupe" tool let me raise a magnifying glass to see a detail of the photo. But the only way I could view the image nearly full screen was to start a slideshow, which necessitated an intervening dialog box; I'd prefer a simple one-click way to just see the photo, without any program chrome around it, as PhotoDirector lets you do just by hitting the F key. A multi-image view let me compare similar photos to choose the best one, but I could only view two images on top of each other, not side-by-side. And it also wouldn't let me move photos separately after zooming, and I could in PhotoDirector (though not in Lightroom, either). On the plus side, I do like how AfterShot lets you zoom with the mouse wheel. You can undo actions, but there are no back and forward buttons or Reset button for those times when you just want to start over with an image. There is a small history window you can call from a menu option, and you can select the action you want to go back to. The reset all option is buried among the adjustment presets, which doesn't make much sense to me from an interface standpoint. This non-modal interface, as with Apple Aperture ($79) has the advantage of giving you access to all the program's features at all times, not requiring you to be in a particular "mode" to, for example, brighten or add tags to a photo. But modes have the advantage of encouraging an actual workflow—getting all your tagging and rating in, and then adjusting, then dealing with output.